It is a pleasure to share with you this homily for the Fourth Sunday of Advent, by Deacon Greg Kandra of the Brooklyn Diocese. Deacon Kandra has a superb blog, The Deacon’s Bench, over at Patheos. Do visit him there often, and thank you Deacon Kandra for this penetrating homily. In the late 19th century, one of the most sought-after realist portrait painters was a Frenchman by the name of James Tissot. He made his reputation painting society women and the wealthy in and around Paris. But at one point in his life, while doing research for a painting, he stepped into a church. While there, he had a profound religious experience. He left a changed man, and devoted the rest of his life to spiritual and religious themes – including hundreds of paintings depicting scenes from the bible, most famously, the life of Christ. The Brooklyn Museum has many of these sketches and watercolors, and they had an exhibit last year. They are beautiful, and moving. They are also deeply human — none more so than a work that has direct bearing on this Sundays gospel. It is a surprising portrait of St. Joseph. 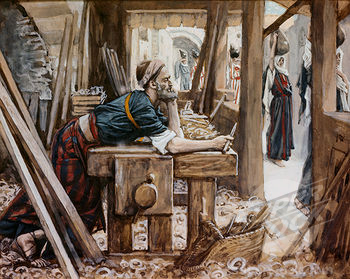 Joseph is shown at his carpenter’s table, with tools scattered around him. His shop is small, cramped, planks and pieces of wood everywhere, shavings piled up on the floor. The windows look out onto the bustling streets of Nazareth, where townspeople are going about their business. But in the middle of all that stands Joseph, bent over his table, his bearded chin in his hand, deep in thought. We rarely think of him that way. But Tissot, as he often does, penetrated to the heart of his subject. Maybe Tissot was showing Joseph the morning before he has the dream we just heard in Matthew’s gospel. Or maybe it is the morning after – and he is coming to terms with what the angel has said, and what he must do. Maybe it was even later, and this new father is concerned with the worries that every father has. But what we see in Tissot’s picture – and what is hinted at in this gospel today – is a man more like us than we realize. We tend to think of Joseph the way we see him in the manger scene outside our church, or on the cards we send, or the pageants that are staged. He is strong, stoic, patient – “righteous,” as Matthew describes him. But Tissot understood that the man betrothed to Mary was a man of worries, and apprehension, and even fear. This morning, I’d like to suggest that Joseph is also a man who speaks to our own time. He is a man for our age – an Age of Anxiety. He must have known economic uncertainty – wondering how he would support and sustain his family, running his own small business. He had to pay taxes – to “render unto Caeser.” Like many people today, shortly after his son was born, Joseph and his family became refugees, immigrants in a foreign land – the land that had held his people as slaves. Joseph also lived with the threat of terror – a ruthless king bent on murdering children. On a more personal level, Joseph knew the anxiety of any man about to become a father. He must have asked himself: am I ready for this? Am I good enough, strong enough, wise enough? And then, confronting the very real possibility of scandal, Joseph must have had more than a few sleepless nights. How, he must have wondered, could he protect and spare the woman he loved? And — like Mary, the woman he loved — he also must have thought at some point: this is not what I had planned. Everything is suddenly different. How many of us have said that about our own lives? How many of us have had to face, like Joseph, a confusing world with uncertainty, and doubt, and anxiety and fear? How many of us have felt like the man in that Tissot drawing, frozen in place, while the world moves on around us, and we stand there and worry and wonder: what do I do? How will I get through this? But into all that, in Joseph’s complicated life, comes a voice in a dream. And his world – and ours – is changed. In the middle of “the anxiety of Joseph” comes blessed reassurance – and a reminder that God’s will sees beyond our fears, beyond our limitations. When our lives can seem a nightmare, we cannot forget to dream. When every demon seems to be making our lives hell, we cannot forget to listen for angels. When our world has been turned upside down, we cannot forget to trust that God will make it right. Again and again, the words come to us from the gospels, in times of confusion and doubt and anxiety. That is the message to Joseph, to Mary, to the shepherds, to the apostles – and to us. 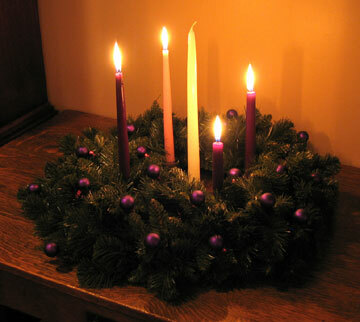 And in these last days of Advent, that is the great message the gospels leave us with as we light the last candle and sing “O Come, O Come Emmanuel.” The light is brighter. God’s presence is closer. If you have any doubts about that, just think of Joseph, the great silent partner of the Holy Family, the man who doesn’t utter a word in the gospels – but whose ability to trust, and to dream, and to listen speaks volumes. In the end, the words of the angel echo down to us as the great defining message of Advent hope — banishing all fear, easing all anxiety. I see myself in Joseph. Many of the things that are happening to my life today have been totally different from what I expected or hoped for. Yet when I accepted them as long as I discern them as that of the will of our God the Father in heaven thru my constant silence and resting in the presence of Him, they become life giving for others and a source of inner joy for me. And they made me feel happy with the thought that I have become a pleasing son to my Father in Heaven.